Why'd you sign such an annoying contract to have to explain, BDN? 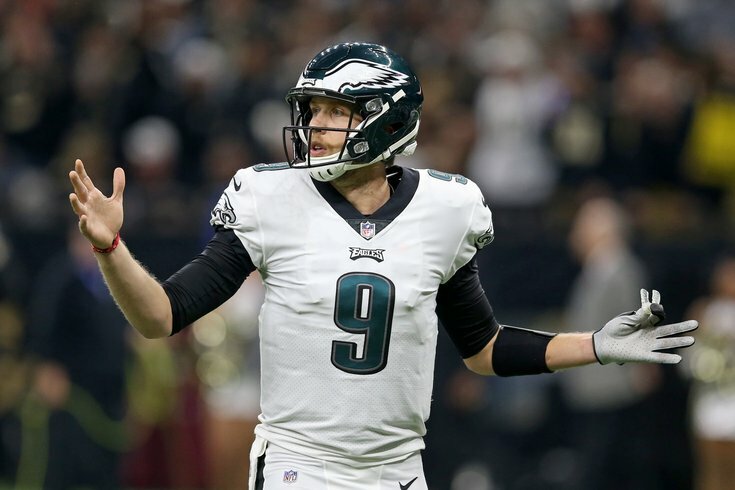 More than a year after being named Super Bowl MVP and then signing an $88 million contract with the Jacksonville Jaguars this month, Nick Foles still doesn't seem to realize he's a household name and face. Purely by chance, the former Eagles quarterback bumped into Lower Merion native Kobe Bryant in Newport Beach, California, last week. Bryant, a lifelong Eagles fan despite his Hall of Fame career in Los Angeles, is well aware of what Nick Foles means to his favorite football team. During the 2017 season, Bryant visited the Eagles during their week of preparations in Los Angeles to face the Rams. Bryant gave the Birds a pep talk, calling them a special group with the capability to win a title. He was even given a No. 8 Bryant Eagles jersey. That weekend, Carson Wentz went down for the year with a torn ACL and Nick Foles stepped in, leading the Eagles to a Super Bowl title — one that Bryant obviously saw with his own two eyes. That's what makes Foles' humility so unbelievable in his encounter with Bryant. Maybe Foles is finally learning that he's the kind of guy who often doesn't need to introduce himself.